Most people know the story of the Titanic—a massive luxury liner deemed the “unsinkable” ship. At the time of its completion, the Titanic was the largest man-made moving object on earth. The company building the ship was so sure it wouldn’t sink, they didn’t include enough lifeboats for all the passengers. Of course the ship wasn’t what it was advertised to be and sunk after hitting an iceberg. Approximately 1,500 people were lost with the ship, including many prominent citizens from multiple nations. It’s an event known throughout history, a real-life event with the plot of a movie. In fact, one of the biggest movies ever made revolved around this tragedy. This disaster took place over 100 years ago and the name of the ship is still part of our common vocabulary. However, despite the century that has passed, the Titanic story is still evolving. Everyone knows the base story about the ship hitting an iceberg, but one major piece missing for years has recently come to light. The Titanic was on fire for days as it was sailing, possibly longer than that. There was a coal fire below deck for days that the crew was unable to put out. The ship sailed along anyway with a fire burning in the hull. 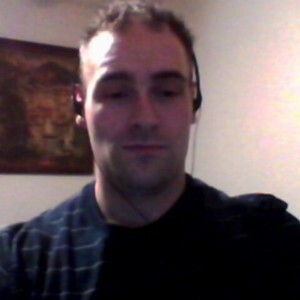 Senan Molony, a journalist in Ireland, has been studying the Titanic for over 30 years. He recently came across an amazing discovery hidden in an attic in England: a collection of pictures taken of the Titanic by the shipbuilding firm before it left the shipyard. One of these pictures shows a 30-foot-long dark mark on the hull, right where the iceberg was known to have struck the ship. Engineers at the Imperial College of London determined the mark was caused by a coal fire that took place in the three-story-high coal bunker on the ship. The fact that a coal fire was burning aboard is well-documented. During the inquiry after the sinking, Charles Hendrickson was brought up to testify and talked about the fire. The fire was known of before the Titanic left Belfast. Hendrickson and three or four other men worked to put out the fire, but the only way to put out a coal fire in a bunker like this was to put the burning coal into the ship’s furnace. A coal fire is extremely difficult to deal with under the best circumstances. Why couldn’t they just “put out” the fire? Because of the incendiary nature of coal. In general, a coal fire is extremely difficult to deal with under the best circumstances. Even with all the resources in the world and a good deal of space to work, they can be near impossible to put out. 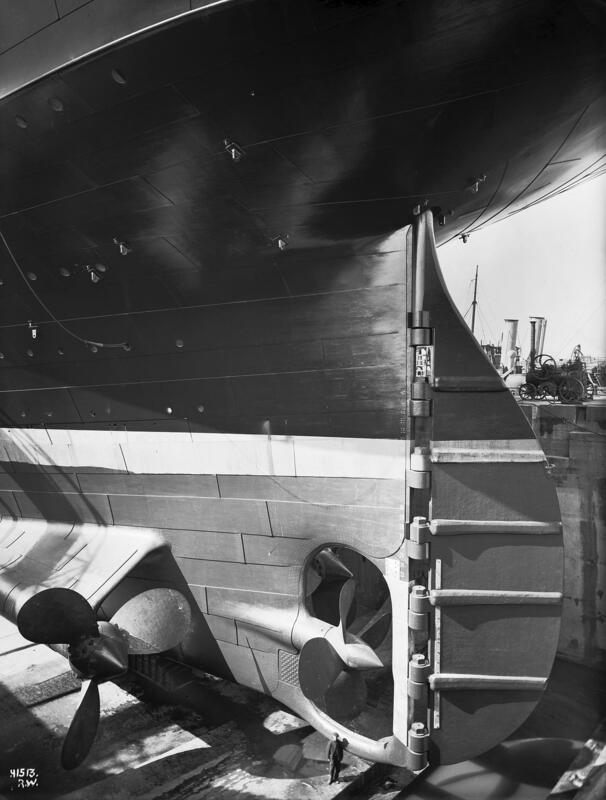 Aboard a ship in tight quarters, it becomes even more difficult. Take, for example, the coal fire in Centralia, Pennsylvania. This fire broke out in a mine in the Northeast United States and has proven impossible to put out. It’s been burning since May 27, 1962—that’s 56 years. Despite numerous efforts to deal with the fire, nothing has been able to stop it. It’s estimated that some sections where the fire is burning are about 1,000 degrees Fahrenheit and create lethal gas clouds of carbon monoxide. Eventually, the federal government gave up trying to put out the fire and just bought all the land from the inhabitants, who moved. Centralia is now a tourist attraction, where visitors come to see the smoke and abandoned buildings. Attorney: What was the condition of the bulkhead running through the bunker? Barrett: It was damaged from the bottom. Barrett: The bottom of the watertight compartment was dinged aft and the other part was dinged forward. Commissioner: What do you attribute that to? Attorney: Do you mean to say the firing of the coal would dinge the bulkhead? In Senan Molony’s new documentary Titanic: The New Evidence, he examines the damage of the coal fire. The area in the coal bunker where the fire broke out was against one of the main bulkheads of the ship. These are watertight walls designed to keep seawater from spreading in case of a hull breach. Molony interviewed fire science expert Guillermo Rein of the Imperial College of London. Rein estimates that the temperature of the Titanic’s fire could have hit about 1,800 degrees Fahrenheit. Rein also says that by the time a coal fire is noticed, it’s probably been burning for days or weeks. 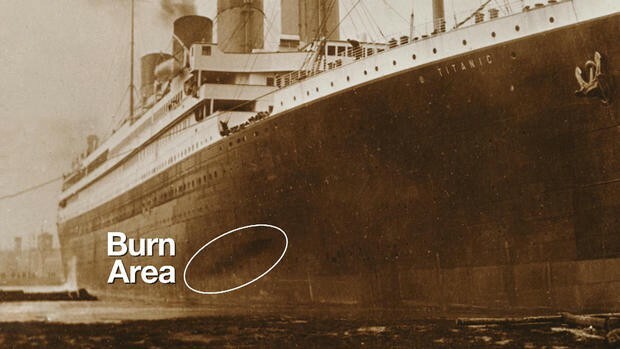 The testimony of the coal stokers and firefighters aboard the Titanic seems to indicate that the bulkhead by the coal area was significantly damaged by the fire. Some even reported a movement of the metal or a buckling. Nothing was done to address the damage. It also appears from the previous picture that a visible mark on the hull was present from the fire damage as well. Another issue with the Titanic was the ship’s speed. It was running at full speed when crossing the Atlantic Ocean—despite warnings of icebergs in the area. There were rumors that the ship was trying to break some kind of speed record, but the Titanic was not built for speed. The mammoth ship was a luxury liner. Molony indicates that the excessive speed could have been caused by the firefighting onboard. In order to fight the fire, the stokers had been shoveling the burning coal into furnaces to burn the fire away. If the stokers had been shoveling as much coal as possible, then that could be the reason for the speed of the ship. As excess coal burned, the engines would work harder, generating speed. The stokers had been shoveling coal into the furnaces nonstop for three days fighting the fire. Molony thinks this is the reason the ship was going full speed when it hit the iceberg. At 11:40 p.m. on April 14, 1912, the Titanic struck an iceberg, which tore into its hull. Right after the strike, according to Molony’s documentary, the bulkhead compartments appeared to be doing their job holding the water back. The Titanic’s designer was aboard the ship and evaluated the strike damage, and he seemed to think the ship wouldn’t sink—as long as the bulkheads held up. However, one of the main bulkheads reportedly had been damaged in the fire. Molony reports from a transcript of the American Inquiry into the sinking where lead firefighter/stoker Fred Barrett reported about a failure to the bulkhead. Barrett was below when the iceberg struck and took refuge in another watertight compartment in the ship. He actually stood behind the bulkhead that had been damaged by the fire. Approximately two hours afterward, Barrett reported seeing, “a wave of green foam come tearing between the boilers.” At this point, the bulkhead failed and Barrett escaped the incoming torrent of water. In Molony’s investigation, the ship began sinking rapidly after this event. 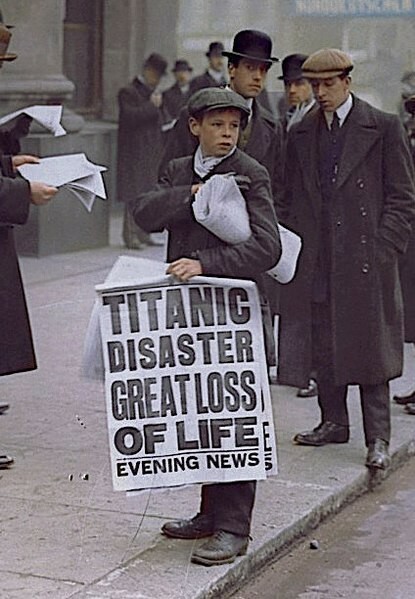 Colorized photo of Ned Parfett, best known as the “Titanic paperboy” April 16, 1912. Photographer unknown. Molony’s documentary is compelling and the arguments logical: The hidden fire caused damage to a bulkhead. The increased speed was due to the excess burning of coal to fight the fire. The bulkhead’s failure was due to the incredible heat generated by the coal fire, which was right against it. If the bulkheads would have held, then the passengers on the ship might have been rescued. In Molony’s opinion, if the bulkheads would have held, then the passengers on the ship might have been rescued. A ship had been hailed and was on the way for rescue. If the Titanic could have stayed afloat for a few hours longer, the magnitude of the historic tragedy may have been averted. The bulkheads were the Titanic’s prime defense against the ocean. The ship’s lack of lifeboats was rationalized because the Titanic itself was thought to be a lifeboat. The bulkheads were designed to keep the water out in case of a breach, which would give time for a rescue. If the bulkheads failed, however, disaster was imminent. Molony investigated why the ship would have left port with a fire onboard. According to interviews and research into the White Star Line (operator of the Titanic), it appears the company was in financial trouble. The Titanic’s introduction had already been delayed, and its sister ship had been damaged, causing more economic losses. The Titanic needed to sail on schedule or the company might have imploded. Others disagree with Molony’s conclusions. For example, David Hill, a previous secretary of the British Titanic Society, admits there was a fire, but believes it really didn’t make any difference—the iceberg was the prime villain. Molony can’t prove his theories completely, but there’s evidence to back his claims. Ultimately, it can’t be denied that there was a fire and it was burning at the time of the Titanic’s maiden voyage. The image of the ship being taken down by ice might have to be adapted to bring in fire as well. Despite the new evidence, nothing changes the fact that the story of the Titanic is a tragedy. The events that happened could have been avoided and all the people aboard needlessly died horrible deaths. In the end, the only thing the new evidence indicates is a new level of negligence and risk-taking by those in charge. A ship that was ill-equipped with lifeboats was sailed, while on fire, through an iceberg-infested area at full speed. That the British inquiry buried the testimony about the fire only adds to the tragedy. Even 100 years later, the facts of the case can elicit a new level of anger. It’s not hard to put yourself in the shoes of those victims, whose only fault was believing they were safe aboard an “unsinkable” ship.